The award was given by the San Andreas Regional Center (SARC), a private nonprofit corporation funded by the State of California to serve people with developmental disabilities. The award ceremony, called the 11th Annual Service Above Self Awards Dinner, was held in late October. The annual dinner is an opportunity to honor those who have made significant and exemplary contributions in the field of developmental disabilities. More than 600 people attended the event. Crown/Merrill Dining Hall employs eight staff members from HOPE Services, a local nonprofit that helps people with developmental disabilities so that they can live and participate in their communities. HOPE Services operates under the umbrella of SARC. The campus HOPE employees are "some of the hardest-working people I've ever worked with," said Daniel Tokar, service manager for Crown/Merrill Dining Hall, who accepted the award at the dinner. "They always have a good attitude, their teamwork is amazing, and they're always putting out a big effort." Two of the HOPE dining hall employees are non-developmentally disabled people who serve as job coaches; six are HOPE clients receiving job coaching. The nonprofit has had up to seven crews employed at the various UCSC dining halls in the past. HOPE staff member Aaron Szoke gave a speech at the dinner that left "not a dry eye in the house," said Tokar. The speech was so well received that SARC later flew Szoke to San Diego to give the same speech at another event. 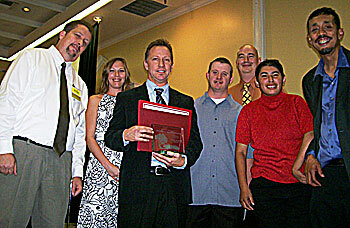 UCSC has employed people in the HOPE work programs for 25 years. The HOPE staff members are assigned dish room tasks and are critical to the successful functioning of the dining hall. In spite of changeovers and budgetary cuts, UCSC has remained committed to continuing the contract, said HOPE Services' Hagemann. This opportunity translates to a variety of things for each crewmember, such as more financial independence, social opportunities, and skill building, she said. "They're the true heroes of the dining hall," said Tokar. "Day in and day out, they're working in the dish room. They are very consistent." Crown/Merrill Dining Hall feeds 1,000-2,000 students a day during the HOPE staffers' shift--7:30 a.m. to 3 p.m.
"That's a lot of dishes," said Tokar.